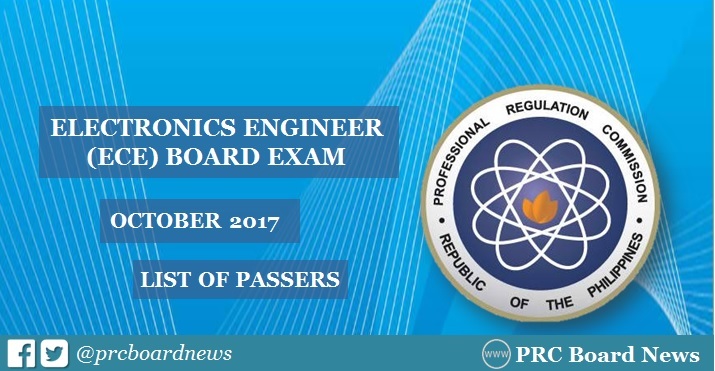 MANILA, Philippines — The Professional Regulation Commission (PRC) and the Board of Electronics Engineering (BEE) released official results of October 2017 Electronics Engineer (ECE) board exam today, October 27, 2017 or in four (4) working days after the last day of exam. The complete list of passers, top 10 (topnotchers), top performing schools and performance of schools are available on this page as announced online. UPDATE: 2,235 out of 4,784 passed ECE board exam. PRC administered the ECE licensure exam in the cities of Manila, Baguio, Cagayan de Oro,Cebu, Davao, Lucena and Tuguegarao on October 21 and 22, 2017. Another examination for the Electronics Technicians (ECT) was conducted on Monday, October 23. The two-day exam for October 2017 ECE board exam covered the following subjects: Mathematics (20%), Electronics engineering (30%), General engineering and applied sciences (GEAS) for 20% and electronics systems and technologies (EST) for 30%. According to PRC Resolution No. 2016-1019, the target release of results for the recent ECE board exam is on Thursday, October 26 or in 3 working days after the last day of exam. In October 2016, PRC released results in three (3) working days after the exam. A total of 1,914 out of 4,742 (40.36%) successfully passed the tests. The results of October 2015 exam were also announced in 3 working days. PRC named 1,784 out of 4,467 passers of the ECE board exam.